You know it’s Fall when the pumpkin spice foods cover an entire aisle at the grocery store. 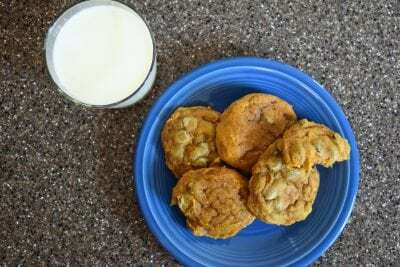 And that means it’s time to make Pumpkin Chocolate Chip Cookies . Now I like pumpkin chocolate chip bread, but I love the cookies even more. My family has this terribly unhealthy habit of making cookies every Sunday afternoon after church. And in the fall, we feel even more justified in our Sunday cookie eating. 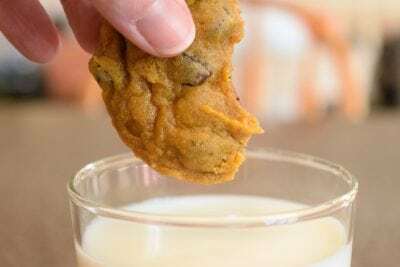 Eating cookies every Sunday afternoon began years ago when I threw off the meat and potatoes Sunday dinner. I think my husband wanted me to be a person who makes pot roast potatoes and gravy every Sunday. It reminds him of childhood. But in truth, I don’t get a craving for meat and potatoes on Sunday. Mainly I don’t want to put in the effort. But I do crave cookies. So one fast Sunday (that’s the Sunday every month when my family fasts for 2 meals and gives the money of our meals as an offering to our church)…so one fast Sunday I was starving. I mean growling tummy, feeling faint and very, very HANGRY! I didn’t want to make a whole dinner, I just wanted quick energy. The natural answer was cookies….ok maybe a smoothie is the “natural answer”, but my “logic in my HANGRY mind” answer was make chocolate chip cookies. And nobody argues with cookies…well except gluten-free people and that’s not me. So we made cookies. Now this is a lesson in why you shouldn’t start something with kids you don’t want to do repeatedly until you can’t stand it. Because my kids wanted cookies every Sunday from then on. And it was cute for a while, but I found myself having to try and change up the repertoire of cookies. 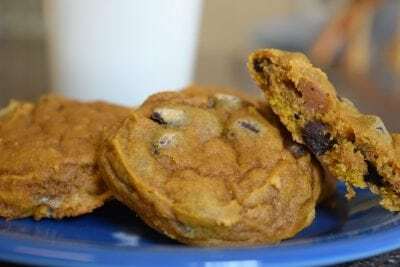 So it’s a wonderful thing when fall hits and I get to tell the kids to make pumpkin chocolate chip cookies –For a change. But I almost never get to suggest we don’t make cookies. I love that this recipe comes out moist. Word of warning the cookies are sometimes too moist when stored. So leave them out to cool completely and then some before storing. Full credit for this delicious recipe goes to my sister in law Stacy, she is really the best cook on the planet (’cause Julia Child has departed this world). Moist and delicious with the pumpkin taste of October. Combine sugars, pumpkin, butter, eggs, vanilla, pumpkin pie spice, baking powder, baking soda, salt and flour in mixer until well mixed. Add chocolate chips stir in thoroughly. Using l large cookie scoop placer dough on cookie sheet sprayed with cooking spray. These store well for a week, but can be super moist so let them sit out for at least an hour before packaging for storage.